and a snapshot of the Talk Like A Pirate Day NPC! The DTU Kiosks have received a new player suggested item: the Mystic Blade! This awesome color custom sword was inspired by your fellow player War Ash and can be yours for the price of 28 DTs. So head to Hero Spire or Skull Deep and get your very own Mystic Blade today! 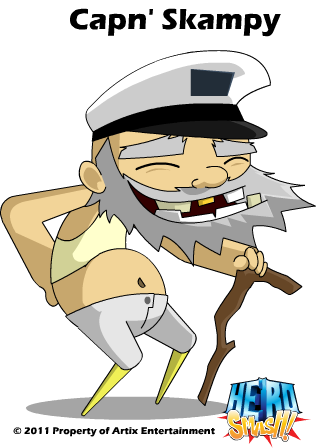 Meet Capn’ Skampy, a goofy old fisherman who knows a thing or two about pirates. 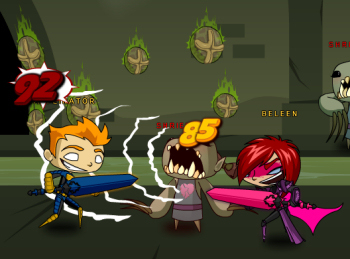 Skampy will be making landfall this Thursday for HeroSmash’s Talk Like A Pirate Day release! And that’s what we be doin’, me hearties! During our Thursday release, you will be able to plunder Capn’ Skampy’s TLAPD shop and brush up on some pirate-savvy lingo. Oh yeah, and make sure to thank Yergen for saving Skampy from Davy Jones' Locker! Yo ho yo ho, it’s HeroSmash for me!